A detailed explanation of engine displacement and the relationship of “bore x stroke” to the power production of your engine. Displacement calculator included at the bottom! Note: 58.8mm is the largest size bore that can be installed on the GY6 engine without machine work to the crankcase halves. The size of a piston-driven gasoline engine (like the GY6 in our buggies) is measured by displacement of it’s internal combustion chamber. The term displacement literally refers to the volume of space the combustion chamber “displaces”, and is usually measured in cubic centimeters (cc’s). Just like when measuring the internal volume of any cylinder (like a can of Cola, which is 355cc by the way), displacement of an engine is determined by the bore size (diameter) and stroke length (depth). 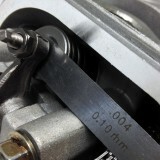 Bore size is simply a measure of the piston diameter. The stroke length is how far the piston itself travels inside of the cylinder. For example, the standard bore of a 150cc GY6 piston is 57.4 millimeters, and the piston travels 58 millimeters within the cylinder every cycle. 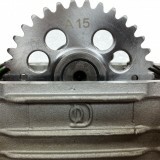 Bore x Stroke = Power! Stroked engines not only have a larger displacement than a stock engine, but there is also a greater amount of torque produced per additional CC when compared to only a bigger bore. 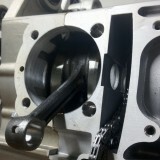 This is because a stroker crank produces more leverage than a stock crank. Think of it like this, it is much easier to remove a stubborn rusty bolt with big wrench than with a small wrench, right? A bigger wrench will take that bolt off easier because your hand travels in a larger diameter circle, resulting in more torque being applied directly to that stubborn bolt. It’s all about leverage and the same principle applies to the crank shaft of your buggy. A longer stroke means that the piston (your hand) has an easier time turning the crankshaft (the wrench) and ultimately the rear tires (the bolt). Helped by this? Leave us a comment! 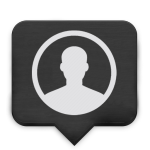 If our tool and explanation helped you, consider leaving us a comment. Feel free to ask questions as well! 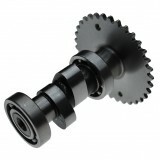 What is the life expectancy of the GY6 with the 180cc big bore kit and 3.2mm stroker crank combination ? What cam / carb combination is available ? Clean, crisp and clear explanation. Now I just need to breakdown my engine and see if I can identify what kit previous owner installed. I was told “175cc”…but as I get to know my engine, many frightening truths have kept me up at night. Awwww… The joys of newbie learning curve!